Gymnosperms has the remarkable evolution history in the Mesozoic era, a long belt and perfect forms of the petrified and compression for of the fossils plants shows the fascinating group in the Triassic and the cretaceous’s era of the Mesozoic. Now they are presented by the only some of the cladistic lines of the evolution like the cycadales and the conifealeas and the genetales (Figure 1). Figure 1: Presenting the distribution of the Enchepahlartos (sources south Africa explored sa venues.com). Black lines in the map are the distribution points of the Enchephalortos. Among them the lines of the cycadales is the very important, since they possess them any features of the evolutionary values, all the plant part form the roots to the seeds have the whole features of the evolution values and metabolites of the medicinal values (Figure 2). Figure 2: Enchepalartos garden (sources cycad pages). There are only 11 lines of the genus which are present in the cycadales, majority of the cycadales are extinct in the Triassic and cretaceous era, however now the cycadales has the very relict distribution in the different part of the world. In this review articles we are presenting the some of the aspects of the genus entitles as the Encephalartos. The genus Encephalartos comprises about the 68-70 species all over the globe and endemism can be seen in the South Africa. South Africa is supposed to be the centre of the origin of the Enchepahalartos . Majority of the species are distributed in the north and the South Africa. About 35 species has been reported in the only South Africa another some of the species can be found in the Ghana, Benin, and Angolas (Figure 3). Figure 3: Encephalartos plantation (sources Cycad pages). The regional centres of the biodiversity are found in the South Africa where endemism is found and it is in peak . 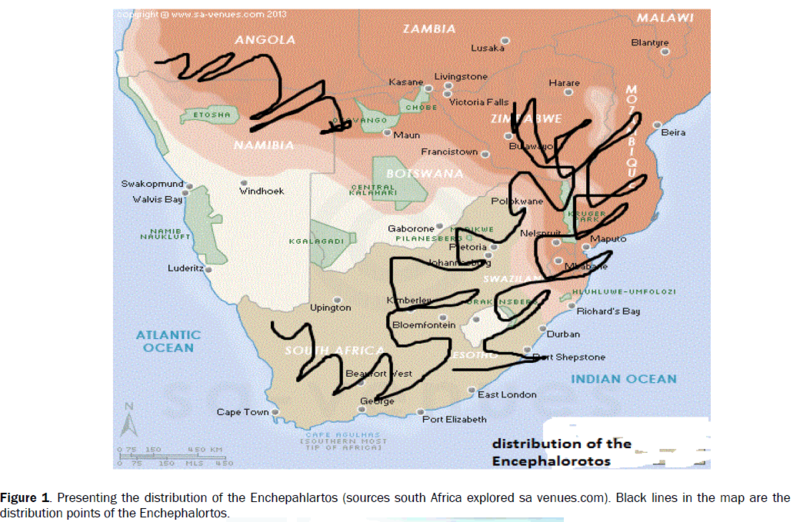 In the South Africa content belt of the Encephalarotos can be found form the north to the south area. Several species of the Encephaloretos occurs in the form of the patches . Some of the features of the Encephalartos are enlisted as. 1) They are the perennial tress. 2) Majority of the species are dioeciously. Both of the sexes are found on the separate trees. 3) Among the 40 species of the genus some of the species age underground and the other are the above ground, some of them are designated as the trees. 4) Majority of the Encephalartos are long lived, some of the species of the genus is of the 130 years long and in some of the cases 1000 species has been reported . 5) Pollination generally occurs by the Beetles, and weevils, and long urild and cucucid. 6) However, reproduction occurs in majority of the species simultaneously. 7) The year when most of the plants bear cones, it has been termed as the cone-year. 8) The seeds viability depends on the population of the beetles, since for them the seeds of the cycads are sources of the food. 9) Seed predation is common in the Encephalartos, when weevils in the genus destroy majority of the seeds for the feeding purposes. 10) The dispersal of the seed is very less understood, the dispersal of the seeds occurs by the rodents and the birds and baboons. 11) Species of the Encephalartos occurs in the tree, garden, and Savannah. 12) The greatest diversity of the Encephalartos occurs in the savanna, since this is the open grassland and provides the place for the cultivation of the Encephalartos. 13) This cycad is known as the kafir bread, due to the bread like pith of the stem of the genus. Insects as the reservoirs for the different purposes. Threat factors: Iucn conservation status declares that there are many threats to the different species of the Enchepalratos, 70% species of the Encephalortos are declared as the threatened with extinction, three of the species are declared as the extinct in wild, and some of the other species has been declared as the endangered . • Habitat loss and degradation. • Improper harvesting of the tree for the various purposes, some are for the hunting and other are for harvesting. • Pollution of all kinds are another reason for their degradation. • Utilization of the plants for the various purposes. • Various natural factors like the beetles and the other insects. • Losson of the species by many reasons. • Different kinds of the machines reduce the cycad belt. So planned cultivation and the conservation of the plant is utmost urgency for the conservation of the plants . Downie DA, et al. Molecular systematics and evolution in an African cycad-weevil interaction: Amorphocerini (Coleoptera: Curculionidae: Molytinae) weevils on Encephalartos. Mol Phylogenet Evol. 2008;47:102-16. Donaldson JS and BÃÂ¶senberg JD. Changes in the abundance of South African cycads during the 20th century: Preliminary data from the study of matched photographs. Biology and Conservation of Cycads. International Academic Publishers, Beijing, China. 1999. Donaldson JS. Is there a floral parasite mutualism in cycad pollination? The pollination biology of Encephalartos villosus Lemaire. International Academic 2008.01.023. Am J Bot. 1997;84:1398-1406. Cycads during the 20th century: Preliminary data from a study of matched photographs. In: Chen CJ (ed) Biology and Conservation of Cycads International Academic, Publishers, Beijing, China. Da Silva JM, et al. Population genetics and conservation of critically small cycad populations: A case study of the Albany Cycad, Encephalartos latifrons (Lehmann). Biol J Linnean Soc. 2012;105:293-308. Raimondo DC and Donaldson JS. Responses of cycads with different life histories to the impact of plant collecting: Simulation models to determine important life history stages and population recovery times, Biol Cons. 2003;111:345-358.